There has been a lot of change in our lives this year, the biggest being, I'm working full time now. I work from home, but it is still full time. One of the first questions I get when talking about my job with people is, "Did you put Katarina in school? "quickly followed by, "But how does that work?" when I assure them we are still homeschooling. A big part of homeschooling in our family has always been the ability to be flexible with our schedule and make school work for us. It isn't unusual for Katarina to do more than one day's worth of work at a time to "earn" a Friday off of school. We don't take winter break, President's Day, or many other days that schools shut down for holidays, but we do take a break for most of December. As my work hours increased, we had a little trial and error to figure out what worked best. For us, mornings are the best time for school, but not first thing. I start my work day early, while the rest of my family is still sleeping. When Katarina wakes up, she has about an hour and a half to relax before her day officially stars. During this time we eat breakfast, have a morning walk, and Katarina usually reads or works on one of her computer programing projects. Then it is time for school to start. I take a break from work and do some teaching, and then as I go back to work, she finishes up the rest of her school day's writing and reading assignments. I step in when she has any questions, and look over her finished work as the day progresses. In the last few weeks, one of Katarina's favorite subjects, Pre-Algebra, hit a difficult patch. While simplifying radicals was, well, simple, dividing with radicals proved to be a little harder. I felt the pressure of trying to juggle work, life, and homeschool while trying to remember how to use math I haven't thought about since I was 14. And trying to do that during those morning hours wasn't working well for either of us. So we made a new decision. We started saving Pre-Algebra not just for the end of the school day, but for the end of the day entirely. After dinner we have been sitting down with our math problems, pencils, paper, and Khan Academy, and conquering radicals. And it is working. Katarina doesn't feel the pressure of the rest of her school day hanging over her while she calculates, and is sailing through her work without either of us melting down. And we still have time for a couple of episodes of The Wonder Years before bedtime. For now, we are keeping this new math in the evening schedule. It might change later in the year, but we both like the way this is working. That is the key to homeschool - not just viewing it as an opportunity to be flexible with your schedule in regards to vacation days, but also an opportunity to be flexible with everything, and mold school to fit your child's needs. I'm very blessed that I'm working at home, so I don't have to go into an office each day. It also helps that Katarina is eleven years old, and I'm not needed for every second of her school day the way I was when she was younger. As our lives and needs change, homeschool is changing with us. That doesn't mean we might not make the decision to try something different next year. We have the "what about public school" conversation each summer. I'm not against the idea of traditional school, and I don't believe homeschool is the answer for everyone, but for now, homeschool is our best answer. And even though our schedule might not be a good fit for your family, it has been great for us. 1. Learn which hours are best for your child. Are early mornings the best time for focusing, or do you find that afternoons work best? Does your child need some down time before school starts or part way through the day? Don't feel like you have to keep the same hours that your local school is keeping. Try different times to see what works best for you. 2. Don't be afraid to make curriculum changes. This is true for your curriculum as a whole - you might find that the fancy curriculum package you bought just isn't working - but it is also true for smaller things like taking a few days to focus on something or do extra study if your child is really interested, or swapping out a book for something that you think your child will enjoy more. 3. Take advantage of all the resources available for homeschoolers. From your local library and free educational websites like Khan Academy (have I mentioned how much we love Khan?) to co-ops and local homeschool associations, you don't have to do this thing alone. You also don't have to spend a lot of money to homeschool. 4. Ask for help. You might be the primary teacher in your child's life, but that doesn't mean you have to do everything. If your spouse is a science whiz, there is no reason for you and your child to struggle with something you aren't gifted at if it could be put off until later in the day when Professor Labcoat gets home from work. Or maybe it isn't an all the time issue, but you find yourself having a particularly difficult week. Call in favors, invite the grandparents over, tell your spouse you need extra help, or just take the week off to read and watch educational videos. We always build in extra time for off-days in our year for just these times, so if one of us needs a break, we don't have to stress over falling behind. If you need help, you have to ask. And if you aren't willing to ask for help for yourself, do it for your kids. Modeling this kind of self awareness and self love for them is one of the best lessons you can teach. 5. Don't compare your beginning to someone else's middle. This quote is often used as blogging advice, but it is true in almost everything in life, homeschool included. If you are starting out with a five year old, you won't be able to say, "Read five chapters in this book and write a summary for me," and then go sit down to an hour of uninterrupted work. All homeschool families have bad days (yes, even the ones with picture-perfect blogs), we all hit rough patches, and we all have to learn that what seems to be working for everyone else in the homeschool world might not work in our family. Don't get discouraged on your journey by looking how much farther down the path other people have traveled. 6. Be Flexible. I think this one fits with almost every point in this list. Make a schedule, have a plan, get a routine going - all of those things have their place - and then be willing to throw all of that out the window when needed. 7. Have fun. Take a nature walk before cracking open that science book. Have art twice a day. Read really fun books together. Share your passions, and watch as your children develop passions of their own. Enjoy the extra hours you get to spend with them each day. This is some of my best homeschool advice. I know it didn't tell you which curriculum to buy, or how to write a lesson plan. That is important stuff, and you will do it, but I think these things are what you need to support all of those decisions. The best curriculum in the world won't mean anything if you haven't learned how to make homeschool work for your family and your schedule. How do you make school work in your family? 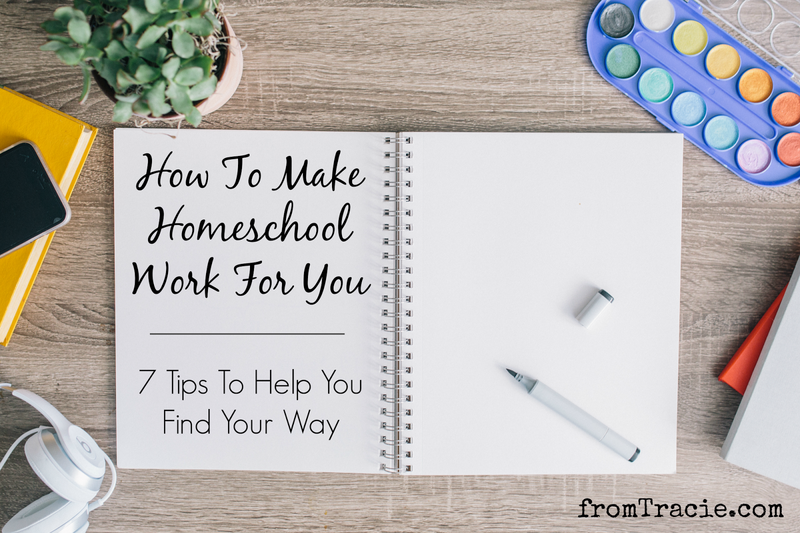 Even if you aren't a homeschooler, leave your best tips in the comments, or share what is working for your kids. We can all learn from each other as we navigate parenting and school - no matter what kind of education is best for our individual children. I have so much respect for parents who homeschool. My kids go to public schools because homeschooling wouldn't work for us. These are really good tips Tracie. I'd love to interview you for our podcast for Busy Moms. I know there are lots of mothers who'd be interested in hearing about homeschooling AND working full time. What a feat! These are great tips and I've done most of them over the years of homeschooling. I think the flexibility is probably my favorite part about it, making it work and work the best for the kids and mom! I admire you for working full time and making it work! These are all really great tips and I'm trying to read up as much as I can on homeschooling since I'm planning on homeschooling my toddler when she gets a bit older. My younger brothers were home schooled and it was a blessing. However for my son a public school works better because he is already taking college courses at 14 so I know i could never keep up with him. This post is coming at a timely manner, we have had so many snow days the kids brought home work, I find it impossible to get them to settle with the snow outthere. I am right on the precipice of homeschooling and this feels like it was written just for me, so thank you! There are so many questions/concerns/hopes/worries/fears, but I think this nails it exactly - jump in, get your feet wet and adapt as needed. Geronimo! I love Khan Academy! Even though both my kids go to public school, I encourage them to do a module of their choosing there every week! We have considered homeschooling several times and so far public school has won out. But, like you, it's something we consider almost every summer. Keeping things revolving and changing is important, but it really comes down to what works for your family. I homeschooled my kids, but my daughter went back to a private high school. Homeschooling works very well for my son and my schedule. You know I'm not a homeschooling mama, but I love how you make it work for you, so much. And I love that you share your experiences openly and honestly for others to feed off of. Some days I want to homeschool and others days I have no desire to. Takes a real commitment from the parents. Kudos to you! I have always thought about homeschooling but somehow it never seems to work for me. Thanks for these tips. We love Khan Academy over here also! It's been a while since we've used it, so thanks for the reminder! I love how with homeschooling you can do things around your schedule and your child's schedule. This is our second year homeschooling, and while it has it's ups and downs we are really enjoying it! I can't imagine homeschooling my kids, and give you a lot of credit for doing it. It's great that you're sharing what you've learned with those who may be considering homeschooling. I do think you're right that being flexible is important for making home school work. It is also a huge bonus because you don't really get that luxury in public schools. I have so much admiration for those who homeschool. It's not for me or us, but as parents we really do know our children best. The WONDER YEARS!!! Now, I want to watch those shows with my kiddos!! Loved that show! I think this is a great post, even for those who aren't homeschooling. I like the part where you wrote about not comparing your middle to someone else's. I think we tend to pressure ourselves that way but in reality, everyone adjusts differently. Some are more advanced than others and others and vice versa. I really love this post. How apt! I email you to ask how school and work are going, and you blog about it! I agree with others, you rock it, and I know K is getting the best education possible. Sending lots of love, my dear! Great advice. Each parent know what is best and plan the day according. My family is in our second year of homeschooling our 9 yr old daughter. Understanding that our schedule does not need to match a traditional school has made a huge difference this year. We need 'wake up' time in the morning so I work on my writing business and my daughter gets started on her independent work later in the morning. Then we finish up the day with Math and Social Studies. This year has been much less stressful than last year! Thank you for sharing insight into your homeschooling day! My husband and I both work full time outside the home, so homeschooling never looked like an option for us. Despite that, I've always felt that the ultimate responsibility for my kids' education falls to me. We doing lots of learning activities at home. My kids struggle with writing (the physical aspects, not the ideas) and so I've found ways to work writing into our weekends. They love watching educational TV and playing educational games. I ask them about their days and have them teach me something they learned during the day. This is such a great list! I especially like that you emphasize the idea of having fun while homeschooling. I've mentioned to my family that I'd love to homeschool when the time comes, and the unanimous reaction has been, "-but that is so much work!" I think it's fun, and yes a lot of work, to see your little one's grow and to know you've put in the effort to provide them with the best education your family can afford. My sister home schooled my nephew. And it was work, but I was also surprised that he was able to get through his work so much more quickly. He studied and did schoolwork for a few hours a day. But it was far fewer hours than going to school, and he seemed much happier and he was actually learning things. We also homeschool. I have graduated out my son and have my 9th grade left. I would say we love homeschool and the flexibility which we do use but on a normal day we have to get math done first for us because... she simply is the type if we wait till evening when she'd rather be doing other things are talking on phone she will put off math and never get to it. lol so for us most of time we try to get as much done as we can earlier BUT when events are happening we do stuff in evening. We've found that bedtime is a great time to integrate some extra learning. We read a story, but then talk about the plot afterward...and even sometimes incorporate a fun activity. Homeschooling wasn't the norm when my kids were in school but it is so important to make it a win win for the kids and the parents. With the internet being around now I think more and more parents are doing homeschool. I think more stay at home moms are feeling encouraged to do stay at home schooling as well and its becoming more normal great list!